North Shore Land Design is owned and operated by Ron Poulin. Ron started the company in 1983 after graduating from Stockbridge Agricultural School, University of Massachusetts. He currently employs 8 people year round. The company is a member of the Massachusetts Association of Landscape Professionals (formerly Association of Landscape Contractors of Massachusetts | ALCM), a non-profit trade association made up of established companies committed to providing high quality landscape services. Pat has been an employee of North Shore Land Design for over a decade. Also a graduate of Stockbridge Agricultural School, University of Massachusetts, Pat has a certification with the Associated Landscape Contractors of Massachusetts program, the industry's rigorous examination process for landscape professionals. 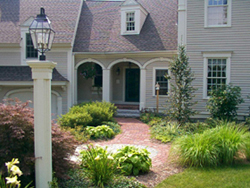 As a Massachusetts Certified Landscape Professional (MCLP), Pat brings to his job the highest level of landscape construction techniques and horticultural expertise.